This well located villa has been recently fully renovated. 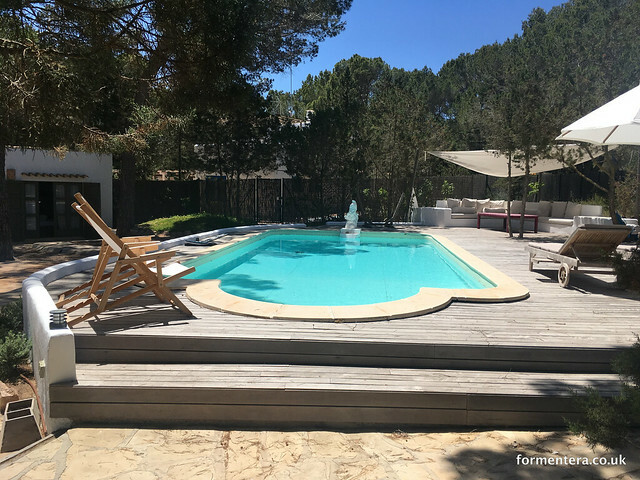 A typical Formentera style house excellently located in a pine wood setting just 100 metres from Migjorn beach with distant sea views through the pine trees. A quiet, and peaceful setting and well suited to larger groups or families. The grouping of 3 villas consist of six bedrooms, three with double beds and three with twin beds, four bathrooms, two kitchens and three exterior terraces, plus two living rooms and private pool. 2 hours cleaning is included for 5 days a week. 200 € final cleaning charge.